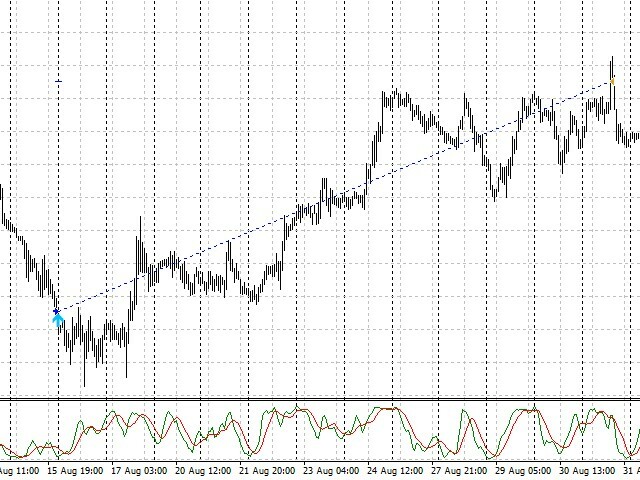 Contr Trend is a powerful trend for counter trend trading. It provides three effective strategy that determine trend reversal: trading from levels, stochastic and a counter-trend strategy (see below for details). 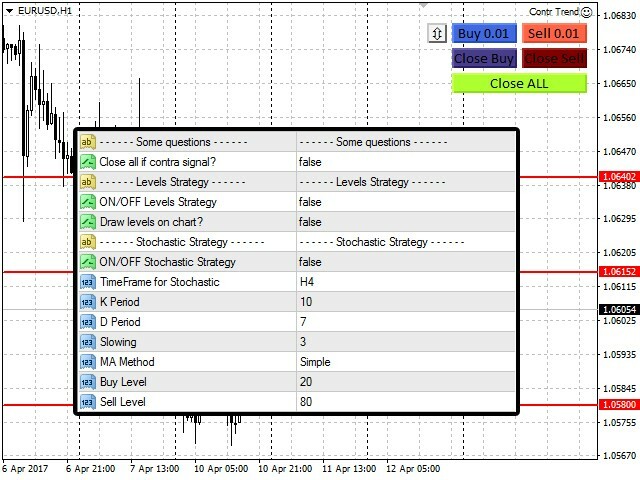 Trading from levels - the Expert Advisor determines strong levels and opens orders expecting roll back from the levels. There are no settings for this strategy, everything is optimized and configured. 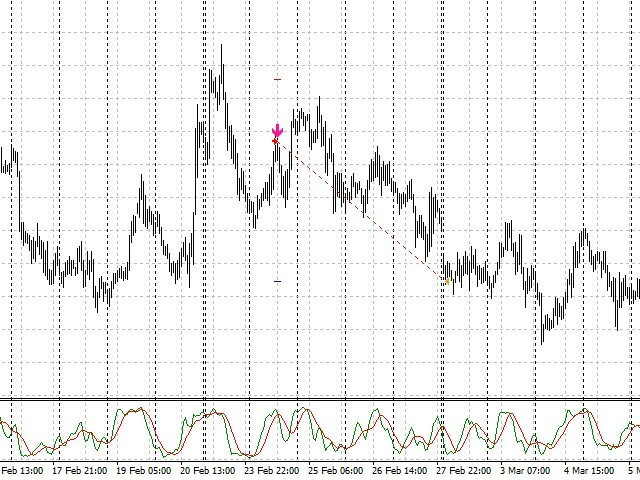 Stochastic - the standard Stochastic is a powerful tool showing the overbought and oversold states of a currency pair. 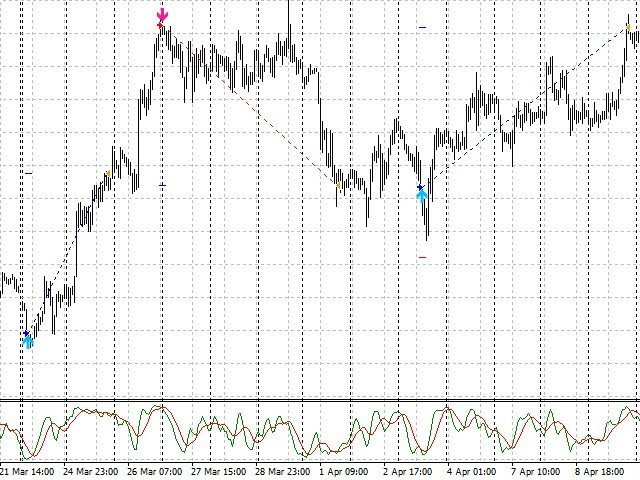 It is recommended to use Stochastic on timeframes H4 and above, but you can set up this option as you wish. 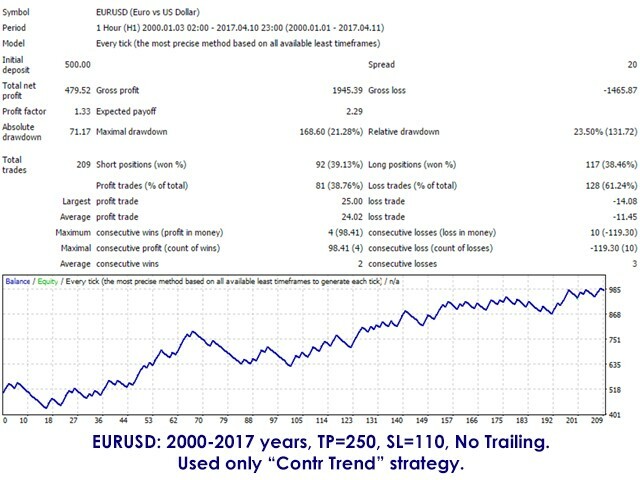 Counter-trend strategy - this strategy seeks large moves, when the price falls or grows for a few days in a row and passes a certain distance in points - there is a high probability that the price will reverse. For better precision, a Stochastic based filter is added. The filter can be configured to your specific needs. Each of the available strategies can be turned on and off independently of each other. If there is no signal from one strategy, the EA will check the other strategy. 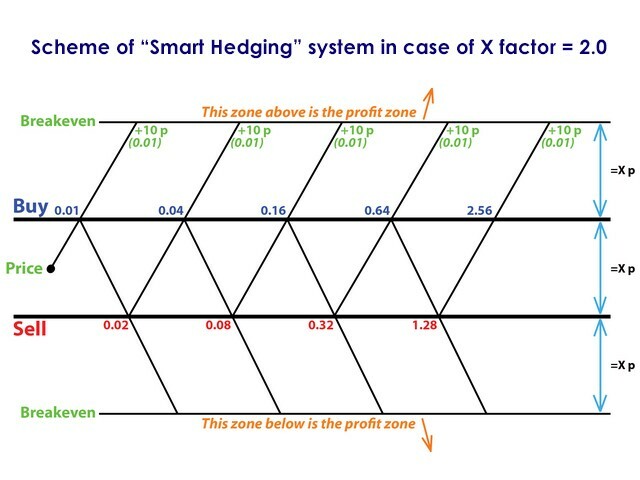 "Smart Hedging" - the system tries to avoid losses. It is based on the Martingale principle, opens orders in the opposite direction with an increased volume. For more details please see the attached screenshots. 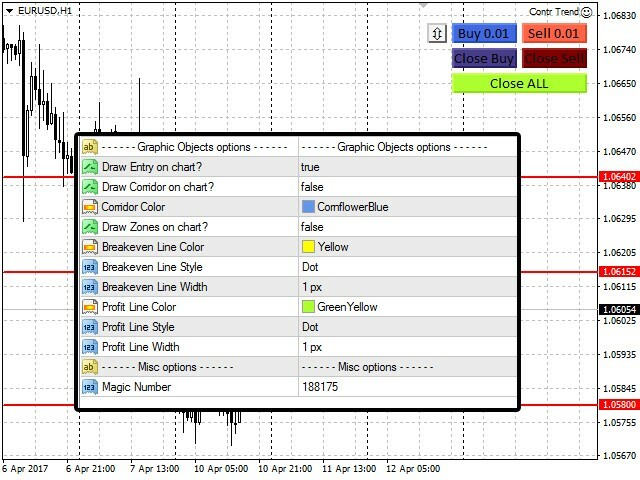 Graphic panel - simple and intuitive interface for manual trading with the buttons "Buy", "Sell", "Close all". 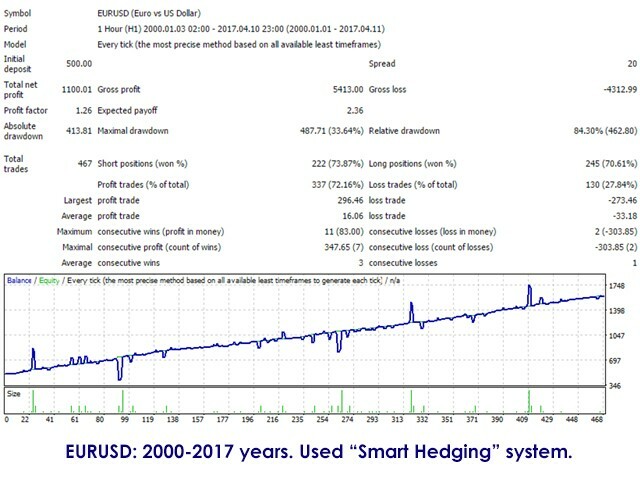 By enabling "Manual Trading" - true, and "Smart Hedging" - true, you can open orders manually, and the intelligent hedging system will try to take your deals to profit if you make a mistake. Start Lot - the volume of an opened deal. Auto Lot - auto lot increase depending on your current balance. Increase lot at 0.01 every - the amount of money, the volume of deals grows in proportion to the growing deposit. Smart Hedge - enable/disable the smart hedging system. Manual Trading - enable/disable manual trading. If set to True , the robot will not open orders. If False, the robot will trade fully automatically. Max Orders - the number of open orders at a time. Distance between orders - the distance in points between hedging orders. Take Profit - the value of the take profit level. Stop Loss - the value of the stop loss level. X factor for pending orders - used for smart hedging - the multiplier of the volume of the last opened order. Profit in breakeven zone in % - the distance in % that the price should move in the breakeven zone for the EA to close all positions. 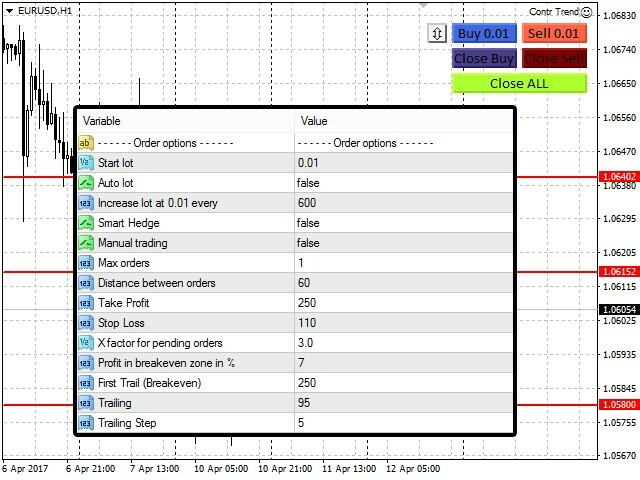 First trail (breakeven) - the parameter indicates when the order should be moved to breakeven. Trailing - trailing the stop loss level following the price at a specified distance in points. Trailing Step - trailing step value. Close all if contra signal? - closing all orders at an opposite signal (provided that the current orders are in profit). ON/OFF Levels Strategy - enable/disable the roll back strategy. Draw levels on chart? - draws levels on the chart (only triggered levels). ON/OFF Stochastic Strategy - enable/disable the Stochastic based strategy. TimeFrame for stochastic - the timeframe of the stochastic. Standard stochastic settings: K Period, D Period, Slowing, MA Method. Buy Level - Stochastic level to search for buy signals. Sell Level - Stochastic level to search for sell signals. 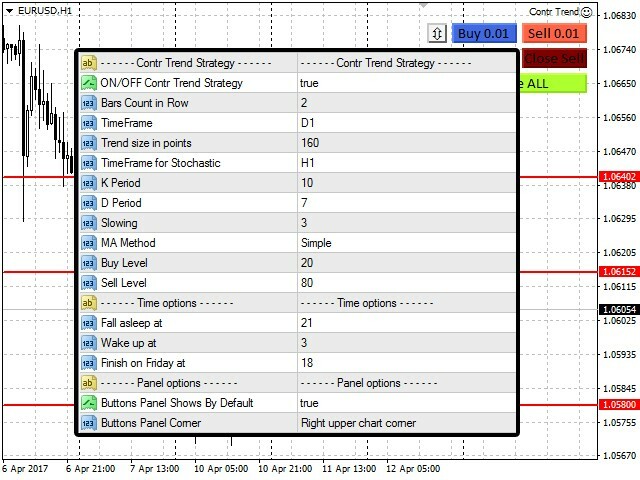 ON/OFF Contr Trend Strategy - enable/disable the counter-trend strategy. Bars count in row - the number of bars rising or falling in a row. Timeframe - the timeframe of the bars. Trend size in points - the distance in points that the price moved during the trend. Followed by similar settings of the filtering stochastic for the counter-trend strategy. In the Time Options section - EA working time settings. In the Graphic objects options settings - settings for the graphical display of object on a chart. Magic Number - EA ID.